Despite continued fighting in Syria between government forces and anti-government groups, Americans in December continued to say that the U.S. does not have a responsibility to do something about the fighting there. 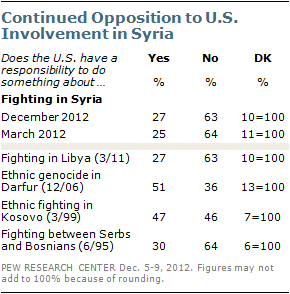 There also continued to be substantial opposition to sending arms to anti-government forces in Syria. In December, only about quarter of Americans (27%) said the U.S. has a responsibility to do something about the fighting in Syria; more than twice as many (63%) said it does not. These views were virtually unchanged from March. Similarly, just 24% favored the U.S. and its allies sending arms and military supplies to anti-government groups in Syria, while 65% were opposed. These opinions also were little changed from March. Comparable majorities of Republicans (66%), Democrats (61%) and independents (65%) said the U.S. does not have a responsibility to do something about the fighting in Syria, and all partisan groups also opposed arming anti-government groups.